It seems as though we are hurtling through the year at quite a speed; it is already the middle of August and we are enjoying the bountiful gluts of courgettes, beans and tomatoes here in Sissinghurst Castle’s vegetable garden. Just a month ago it seemed as though there were not enough hours in the day to pick all of the soft fruit we had growing and ripening on our patch – glorious gooseberries, sumptuous strawberries, radiant raspberries and countless currants. Now their season is over for another year and it is time to prepare for next year’s harvest by pruning the bushes to increase their production for next year. We summer pruned the gooseberry, white currant and red currant bushes at the end of July, and these will need some more attention over the winter months with a more drastic prune to encourage spring growth. The raspberry canes have finished producing and can soon be cut right back to the ground, making space for the fresh new stems to be tied in to the wires. The blackcurrants will not be pruned until the winter when the plants are dormant. This week, however, we have been tackling the strawberry beds. 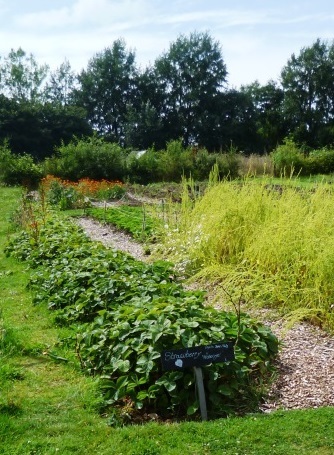 At Sissinghurst we grow a variety called ‘Honeoye’ which crops abundantly in June. The Strawberry patch before cutting back. Now that fruiting has ceased the plants need to have their runners removed to reduce the amount of energy the plant is putting into making new plants, to concentrate their energies into becoming stronger plants. We removed all the runners and planted some back into the row where there had been gaps. 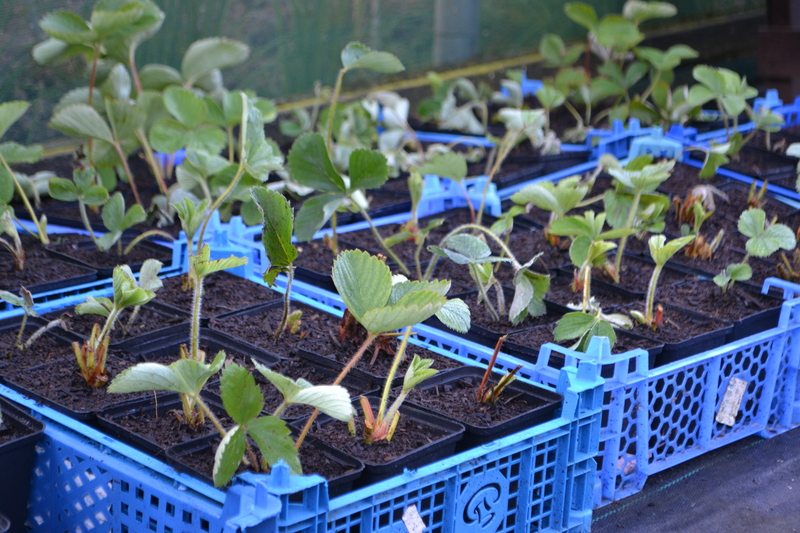 Any spare runners were potted up and will be used to create a new strawberry bed next spring. Once the runners had been tidied up we cut back the foliage of the plants left in the ground to about 10cm above the crown and removed the debris. This is done for two reasons; firstly to encourage new, healthy leaves to come through, and secondly to reduce pests and disease by taking away the old foliage. Strawberry plants after cutting back. A close-up of the strawberry plants after cutting back. Although it looks a little harsh, pruning the strawberries this way should encourage stronger, healthier plants and hopefully we will be overwhelmed with a bumper crop of delicious red strawberries again next year. 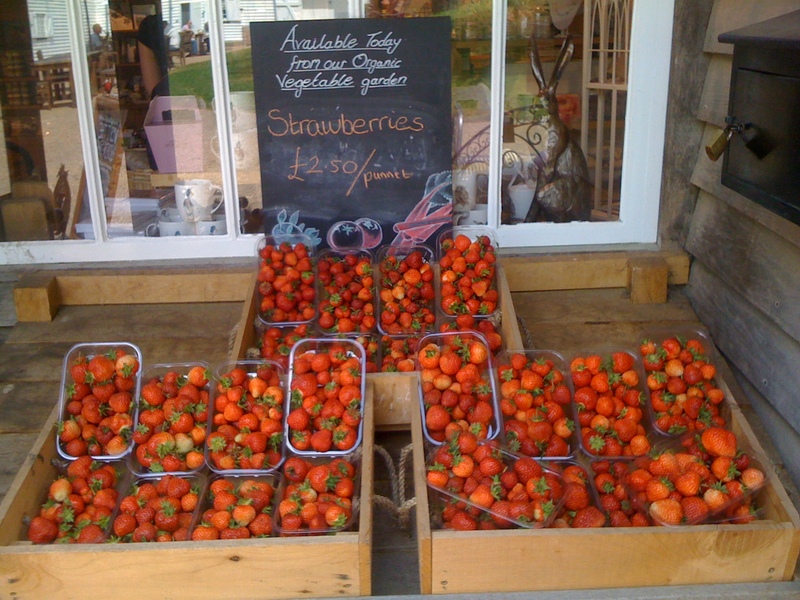 Selling our strawberries at Sissinghurst.